WHISPERS OF REST is a 40-day devotional detox for your soul, a spiritual journey to refresh you and guide you to greater peace, while helping you discover who God truly made you to be: His beloved. Renew your spirit with powerful affirmations of God's love with uplifting words of Scripture, journaling prompts for reflection, and practical challenges to spark joy. Bonnie will lead you to places of rest, where you can deeply experience the Savior's presence in your everyday life. Soul Care Tips & Trail Notes - Reduce stress and nurture your body and spirit. Daily Beloved Challenges - Brighten your day by taking simple soul care actions. A Simple Prayer Practice - Deepen your intimacy with God through easy-to-enjoy prayer prompts, inspired by classic devotional practices. 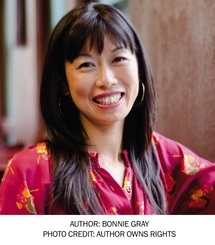 BONNIE GRAY is author of Finding Spiritual Whitespace. An inspirational speaker and retreat leader, she has touched thousands of lives through storytelling, visual arts, nature, prayer, and meditation. Bonnie's writing is featured in Relevant Magazine, DaySpring (in)courage, and Christianity Today. She lives in California with her husband and their two sons. Visit her at TheBonnieGray.com. 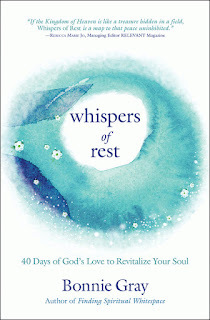 This is a lovely devotional that goes deep into getting to know God in a more intimate way. It is for 40 days, however, you could definitely take 2-3 days on each devotional as they are really meaty. That's what I love the most about this book - it isn't just a page you read and call your devotions done - it's almost a study for each day. It's beautifully written and draws you into God's Word in a unique way. There is really something so restful about Bonnie's writing. I felt such a sense of peace as I read this devotion and focused on the prayers and questions. Each day starts with gentle words that reflect God's character and then a Scripture. There is a devotion and then a section called, "Read God's Story". This goes more deeply into Scriptures that reflect the devotion. There's a prayer then questions to answer as well as a section called "Pray & Rest". There's a challenge to get us to quiet ourselves and our spirit for the day and, finally, some ideas of quiet benefit for the Body, Mind and Spirit. In this very stressful world, this book is truly a breath of fresh air for our soul. I love how it encouraged me to slow down and keep my mind on the Lord. It made a huge difference in my stress levels and how I dealt with life each day. I actually found myself focusing on one devotional over several days because I wanted to really let this sink in. I highly recommend this book and think it will make a difference in your walk with the Lord as it did mine. I give this book 5 out of 5 stars.